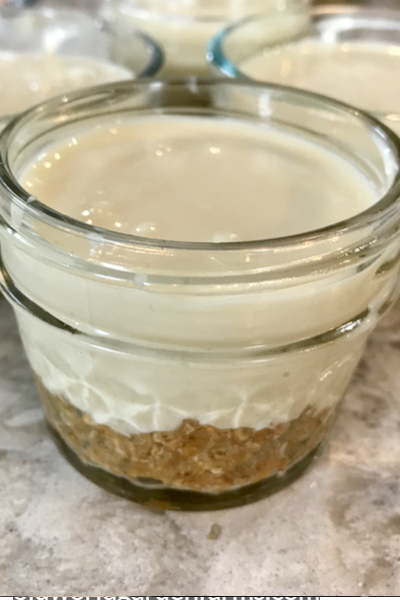 If you love cheesecake, you are going to love this mini no-bake cheesecakes recipe. I have to admit, cheesecake is one of my very favorite desserts. I love to pierce my fork through the soft and creamy cheesecake and cut into a crunchy layer of graham cracker crust. 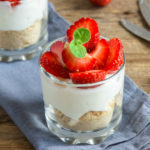 Mini no-bake cheesecakes with a strawberry topping. Once I take a bite, the flavors meld together perfectly in my mouth. And let’s not forget all the different toppings and variations of cheesecake available. 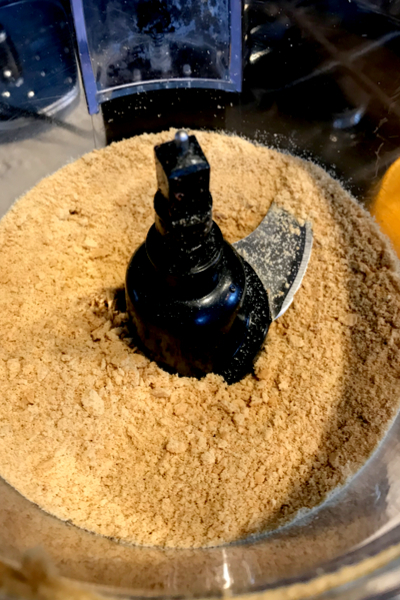 It is easy to make your graham cracker crumbs in a food processor. We love them all, however, the mini no-bake cheesecakes are my all time favorite to make. There are a few challenges when making traditional cheesecake. First of all, you have to make sure to not over mix the ingredients. You must combine all the ingredients until they are incorporated. However, if you over mix the eggs in the recipe, then the cheesecake will not set up properly. In seconds you have crumbs. Then there is the baking process. Have you ever baked a cheesecake and the entire top looks like an earthquake hit it? There are large cracks that sprawl across the top and you are convinced that the cheesecake is ruined. But don’t worry, there is hope!! Baking a traditional cheesecake takes a little practice to get that perfect consistency and texture. But you don’t have to worry about any of that when making these mini no-bake cheesecakes. Add the butter and brown sugar and your crust is ready to go in the jars. They come out perfect each and every time! Not only is there no baking required, you don’t have to wait for hours to eat them! And if you have a food processor, this process is even easier! First of all, we use our Hamilton Beach Duo Food Processor to grind up graham crackers to make the crust. For this recipe, we use a little over half of a sleeve of graham crackers. 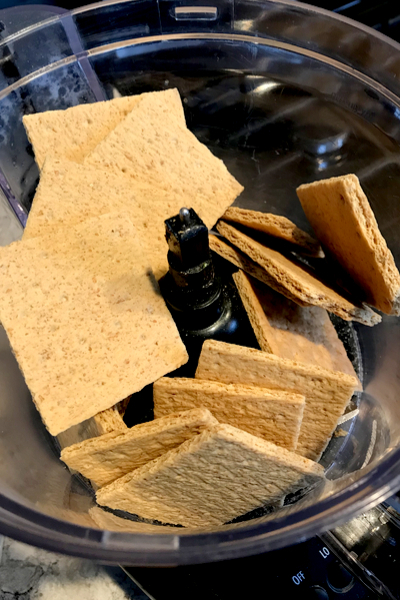 Just throw them in your food processor with the S-blade and you will have the perfect consistency graham crackers needed for the crust. We even use the food processor to make the cheesecake filling. But don’t put that food processor away yet! 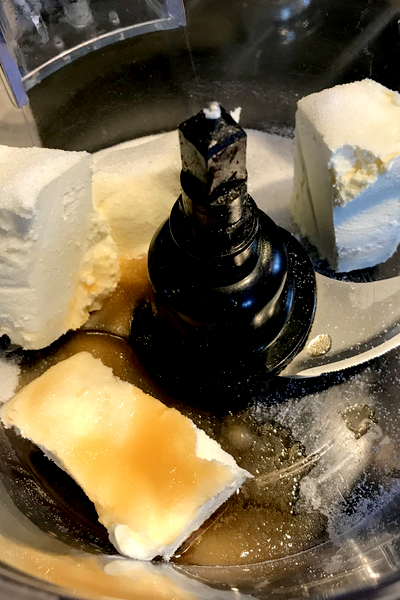 Although you can certainly use your hand or stand mixer to make the cheesecake filling, I prefer to use my food processor. It mixes up the ingredients perfectly. And most importantly, it’s less dishes that I have to do when it comes to clean up time! 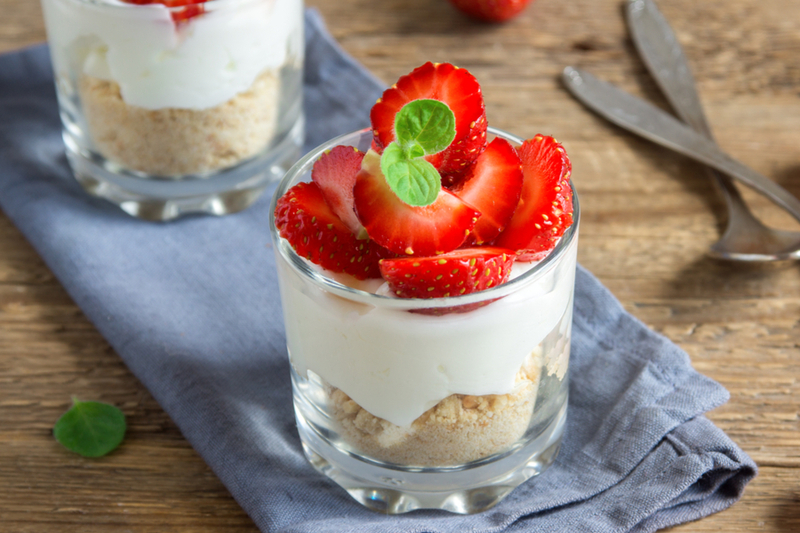 Another benefit to mini no-bake cheesecakes – everyone gets there own individual serving. There is no need to try to cut a larger cheesecake with half of the filling trying to stick to the knife. The cheesecake filling is mixed and ready to be added to the jars. Instead, everyone gets their own jar filled with the delicious graham cracker crust topped with the cheesecake filling. We like to use 4 ounce mason jars for this recipe, however, any small container will work. Small glass yogurt cups, pyrex containers, or even ramekins are the perfect vehicle to hold this dessert. Just be sure not to fill the container to the top! You want to save room for the toppings! And to make it even better, you can top the mini no-bake cheesecakes with whatever toppings that you want. Be sure to leave a little room in the jar for the toppings. When typically set out a few different toppings so that everyone can choose what they like. A few strawberries, cherry pie filling, chocolate shavings, and instant pot caramel are usually the favorites in our house. And if that wasn’t good enough – these mini no-bake cheesecakes can be made ahead of time. Just place the prepared cheesecakes in the refrigerator without the toppings. Once you are ready to serve them, add the toppings and enjoy! 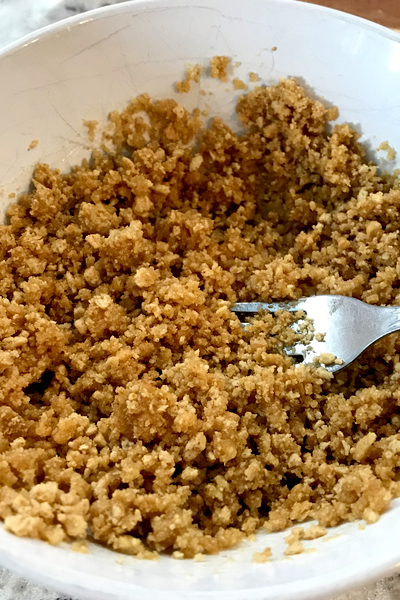 In a small bowl with the melted butter, add the graham cracker crumbs and brown sugar, and mix with a fork until crumbs are well moistened. Press the graham cracker mixture into individual 4-ounce jars. Set aside. 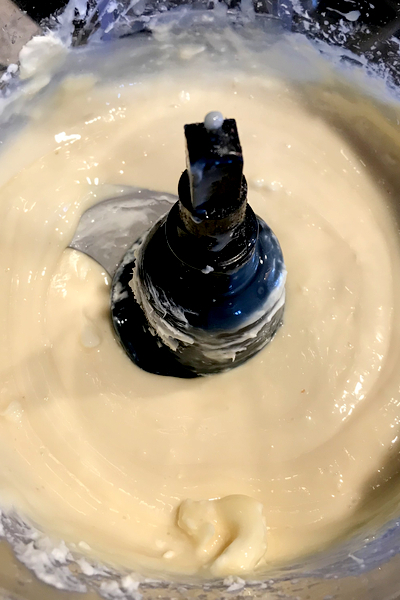 In a food processor or by using a hand mixer, beat together the cream cheese, granulated sugar, and vanilla until creamy. Add the sweetened condensed milk and lemon juice and mix until just combined (do not over mix). Spoon the cheesecake mixture into jars on top of the graham cracker crusts. Be sure to leave room at the top if you are adding any additional toppings. Cover the jars with plastic wrap or lids (if they have one) and place in the freezer for 15 minutes. Remove the jars from the freezer and store in the refrigerator until ready to serve. When ready to serve, add your topping of choice. In the post you mentioned eggs….”However, if you over mix the eggs in the recipe, then the cheesecake will not set up properly.”, but I did not see any eggs in the recipe. Did I miss something? Or did you forget to put the eggs in the recipe??? Or were you talking about putting eggs in a traditional cheesecake and not these mini one?? Hi Rose The eggs mentioned in the article refer to the eggs that are used in traditional cheesecake. This no-bake cheesecake recipe uses no eggs. Hope that helps!